St Mary's, parish church of Attleborough, Norfolk. "ATTLEBOROUGH, or Attleburgh, is an ancient market town, pleasantly situated on the Norwich and Thetford turnpike, 15 miles S.W. of the former place, and 14 N.E. by E. of the latter, and on the north side of the Norfolk Railway, which has a neat station here. In the Saxon era it was the seat of Offa and Edmund, successively Kings of the East Angles, who fortified it against the predatory incursions of the Danes. These fortifications may still be traced in the ridge called Burn Bank. It was afterwards the seat of the Mortimers, whose ancient hall, (now a farm house,) is encompassed by a deep moat. The parish contains 501 houses, 2,324 inhabitants, and 5,247 acres of land. The Rev. Sir Wm. B. Smyth, Bart., is lord of the manor of Attleborough Mortimer, and its members, (fines arbitrary ;) and Mr. C. Cochell is the steward. S. T. Dawson, Esq., is lord of Chanticlere manor, (fines arbitrary,) and the rectory has two small manors, subject to a fine of 2s. per acre on land, and to arbitrary fines on the buildings. The town is comprised chiefly of one long street, with several good inns and shops ; and the market on Thursdays is well attended. The old market cross was taken down many years ago. Fairs are held on the Thursday before Easter, Whit-Sunday, and on Aug. 15th, for cattle, pedlery, &c. A pleasure fair is also held on the day before the March assizes. A stone pillar on the Wymondham road commemorates the gift of £200, by Sir E. Rich,Knt., in 1675,for the reparation of the road, which is said to be the first turnpike made in England, being formed under an Act passed in the 7th and 8th of William and Mary..."
It was also home to many of our family ancestors - with a recorded family line going back to at least 1577 in this small Norfolk market town. My father descended from Attleborough ancestors via his mother, Doris Brooker nee Smith. When my grandmother Doris was alive, I interviewed her several times. She was born in 1904 in Norwich, but she remembered her father taking her on a horse and cart to Attleborough, where he visited a pub with a grapevine outside. I realised that this was his parent's old Attleborough beerhouse, the Grapes, but my grandmother herself didn't pick up on this family history. Since then, I've revealed a very old family history in Attleborough. It starts as I said, with an uninterrupted line from Robert Freeman, who had three children baptised in Attlebough between 1577 and 1581. The family may well have - most likely did have, much earlier connections to the market town - but on record, they start here, not long after parish registers were first introduced by Thomas Cromwell, following the church split with Rome. The baptism of Ann Freeman in Attleborough, 1577, daughter of Robert Freeman. Robert fathered at least three children at Attleborough. He was my 11th great grandfather. 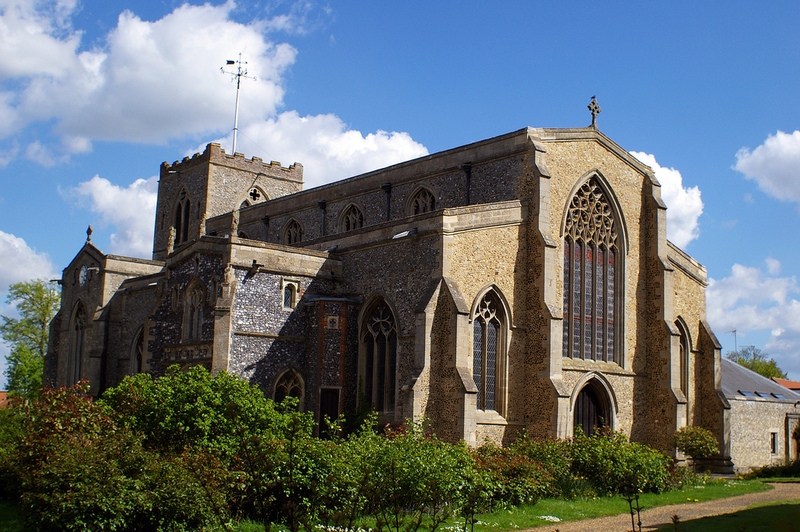 My 9th great grandfather, Robert Freeman was baptised at St Mary's, Attleborough, in 1610, the son of William Freeman. He married an Elizabeth. My 8th great grandfather John Freeman, the son of Robert and Elizabeth, was baptised at Attleborough in 1639. He married Agatha, and they had two sons in Attleborough between 1674 and 1675. My 7th great grandfather, Thomas Freeman was baptised in Attleborough in 1675. He married Elizabeth, and they had five children between 1695 and 1707. My 6th great grandfather, John Freeman, was baptised at Attleborough in 1699. He married Elizabeth. My 5th great grandfather, named after his father, John Freeman, was baptised at Attleborough in 1734. He married Anne. My 4th great grandmother ends the Freeman dynasty for our tree. Elizabeth Freeman was baptised at Attleborough in 1779. In 1803 at St Mary's, she married Robert Hewitt, a farmer - but most likely, not a prosperous one. Agriculture was changing, and many small farmers were losing their land, being squeezed into the ranks of labourers and paupers. They had five children at Attleborough, between 1805 and 1814. Elizabeth died age 52, leaving Robert a widower. My 3rd great grandmother, Lydia Hewitt, was baptised at Attleborough in 1807. She married Robert Smith at St Mary's, Attleborough, in 1827. Robert Smith was also born in Attleborough. He had also farmed land, but the times were changing, and the family fell on hardships. They had six children born in Attleborough, before Lydia died age 37. My great grandfather, Frederick Smith, born in the market-town in 1860. Fred served an apprenticeship as a wheelwright, and moved to Norwich - ending this part of the Attleborough Ancestors story. William Hewitt, my 5th great grandfather, was born near to Attleborough, at Great Hockham, about 1742. However, with his wife, Elizabeth, they moved into the parish of Attleborough itself. There, they had at least seven children, born at Attleborough between 1772 and 1783. Their son, my 4th great grandfather, Robert Hewitt, married Elizabeth Freeman, as noted above. Ten years after Elizabeth passed away, he married again, to Ann Batterby, in Attleborough. We have a lot of Smith ancestors from Attleborough. John Smith a 6th great grandfather, was born circa 1700, married Maria, and was buried in Attleborough in 1776. Their son, my 5th great grandfather also John Smith, was baptised in Attleborough in 1731. He married Judith Dennis at Attleborough in 1771. They had four children there between 1771 and 1778. Their son Raphael Smith, my 4th great grandfather, was baptised at St Mary's in 1775. He married Mary Smith (yes, also a Smith before marriage) at Attleborough in 1798. They had seven children born in the town between 1798 and 1813. Somehow, he received a lenient prison sentence in Norwich Castle Gaol, and successfully appealed for early release. 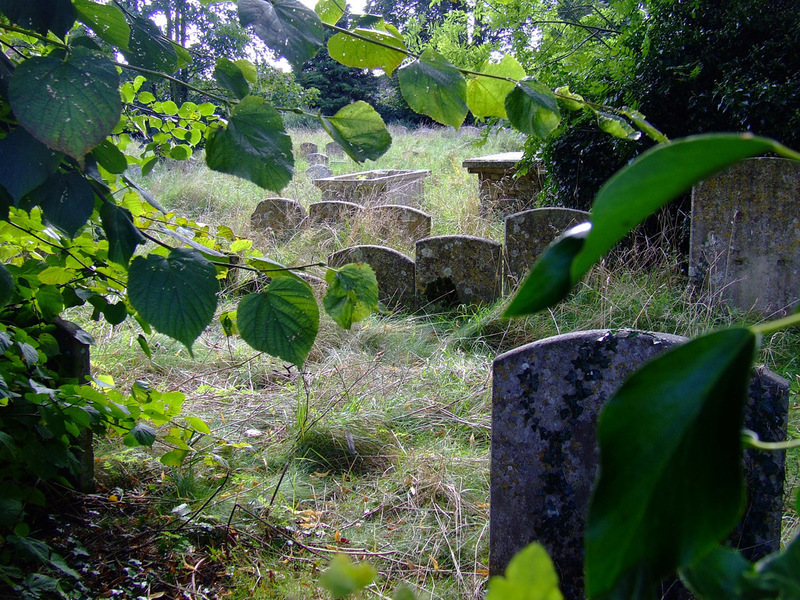 Robert and Lydia raised six children at Attleborough, before she passed away. He then married again, to a Frances Husk. In his fifties, they moved to Sculcoates, Yorkshire, and founded more Smith lineages there. Another Attleborough Smith ancestor - Richard Smith, 5th great grandfather. and his daughter, my 4th great grandmother, Mary Smith, whom married Raphael Smith. That wraps up my father's Attleborough Ancestry. However... I also have some on my Mother's side! John Page, my 10th great grandfather, fathered Robert Page at Attleborough about 1630. Also named Thomas Page - my 7th great grandfather, baptised in Attleborough in 1690. He married Maria Hynds. They moved out of the town, to Besthorpe. The family later moved to Wymondham. There ends my Attleborough Ancestry - at least, that on record. 23 direct ancestors between 1577 and 1860. The association still goes on. We are still in Norfolk not far away. I had a sister marry in Attleborough. I work only a few miles from the town today. 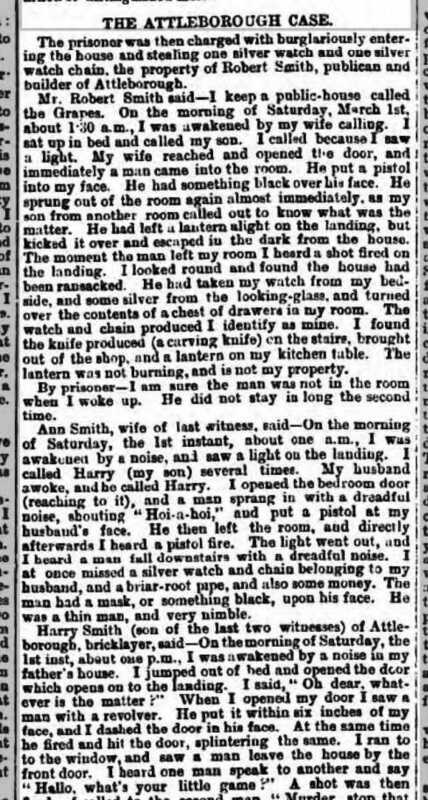 Continuing on from this post about my 3rd great grandfather Robert Smith, who was imprisoned at Norwich Castle Gaol for his part in a swing riot at Attleborough in 1831. His son, my 2nd great grandfather, Robert Smith (the junior), was born 15th December 1832. Yet Robert Smith (the swing rioter), was sentenced to two and a half years imprisonment in January 1831. How did he do that? Was Robert Smith the Swing Rioter NOT my 3rd great grandfather, Robert Smith of Attleborough, born there in 1807? I had problems reading even this copy that I had optimised with an image editor, so I had to get help on a Facebook genealogy group. Apparently it is an appeal by James Stacey, one of the three imprisoned ring leaders, for sentence remission. It also gives notice that the other two, Robert Smith, and Samuel Smith would also be appealing as soon as they had served one year in prison. Did they receive remission? James Stacey, Robert Smith, and Samuel Smith are all still serving time. I don't know how early in 1832 they are being recorded there - but, their sentence types are all recorded as "Rem" (remission), so it does look to me as though their original sentences were reduced. If they were released on remission by late March 1832, then Robert Smith the Swing Rioter had just enough time to return to my 3rd great grandmother Lydia Smith (nee Hewitt), and to father Robert "Hewitt" Smith, the junior. If so, do you see who the rector was at their son's baptism? The Rev. Franklin himself. 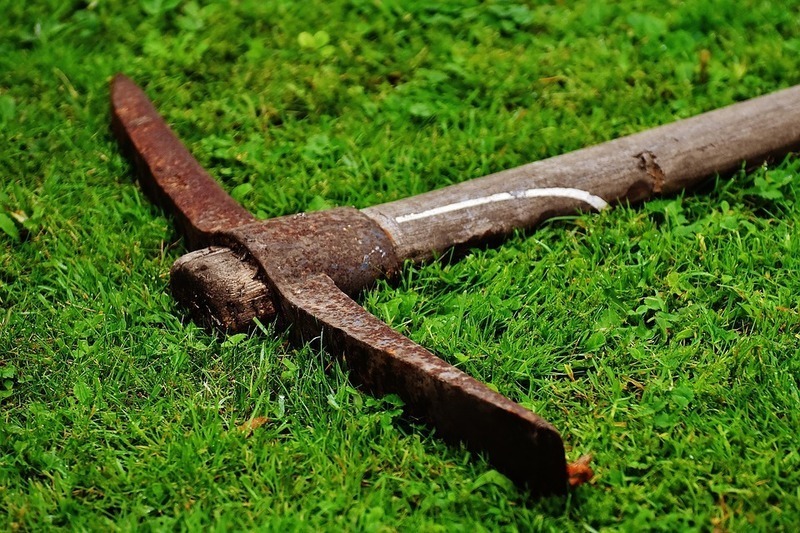 The guy that Robert Smith held a mattock over, that with the thresher burning, attacks on the workhouse, and general rioting, landed him in Norwich Castle Gaol in the first place! Two years later he's baptising Robert's son. Above the confusion of the voices one rang out, more stridant and confident than the rest 'We are the strongest party' the man cried. 'We always have been and we always will be. This is only the beginning. We have begun at the foot, and we will go up to the head.'. Why did he do it? What was Robert's status? Around that time, he was recorded as a labourer. Later, a hawker, and an umbrella maker. Even later in life, after our 3rd great grandmother Lydia, died, he married Frances Saunders (nee Husk), and they moved up North on the railways, to work in the cotton spinning town of Sulcoates. But I may have discovered another element to his story? Why he was angry, and why he was accepted or identified as a ring leader of the riot? Maybe we can now understand him, just a little more. Also on that 1841 census report - you can see his son Robert (Hewitt) Smith the junior, there aged eight years. He's the guy that became the Attleborough bricklayer, and the victualler of ﻿The Grapes Inn﻿, that was held up at gun point in 1879. My 2nd great grandfather, and another story. Another genealogist gave me a hint some twenty years ago, that they'd seen one of my Attleborough Smith ancestors as listed among the inmates of Norwich Castle Gaol. I never followed it up until today, when I bought a second hand book called "Unquiet Country". Voices of the Rural Poor 1820 - 1880. Robert Lee 2005. At least their slow walk gave the two men time to weigh up what was happening. The churchyard was crowded. Francklin noted that many faces were muffled and masked. In evidence, too, were a number of sinister looking sticks, clubs and cudgels, some resting on the ground, some shouldered, some being slapped rhythmically against tensed, sweating palms. "See the flag Dover?" muttered Francklin from the side of his mouth, 'Seems we have a revolution on our hands'. Still furled, but unmistakable and carried with defiant pride, the tri-colour flag of revolutionary France provided a splash of colour in a damp corner of the graveyard. The background was the Swing Riots. Since August, many agricultural labourers and paupers took direct political action in protest against their deteriorating condition, that had been escalating with a long history of enclosure - the privatisation of pastures where the poor grazed their meagre livestock. A favoured target were the new machines of the Agricultural Revolution, such as the threshing machines, which reduced the need for much labour on the land. Masked gangs would set fire to them. A mythical hero called Captain Swing gave name to the riots. Workhouses would be attacked - the places where the poor were expected to plead for food and shelter, living as inmates for the offence of being replaced by such machines. Tithe barns would also be attacked - the farmers were falling over themselves to blame the Church for excessive taxation, that prevented them paying a living wage to their labourers. East Anglia was the epicentre of the Swing Riots. Continuing in Attleborough, the rioters harangued the annual tithe meeting where the parson organised tithes for the forthcoming year. The Parson, the Rev. Francklin, was assaulted when he refused to drop the tithes to a half. He was forcibly imprisoned by the Swing rioters. One of the masked men lifted a mattock (a pick axe-like tool as top photo) when the parson refused to give more than a 10% reduction in tithe tax to the farmers that employed them. Another called for a knife, to cut off his head. The parson and his associates were beaten, the vestry pilloried with stones. Previous to arriving at the church meeting, the mob had already destroyed three threshing machines, and attacked the workhouse, demanding that the master fed them, or they would march him around the town with a stone hanging from his neck. This really was revolution in backwater Norfolk. Hang on. Is that my 3rd great grandfather Robert Smith of Attleborough? It appears so. That hint twenty years ago. He was married only three years earlier, to Lydia Hewitt - by the Rev. Francklin! No wonder they didn't have any children for a few years. He was serving time in Norwich Castle. That was the voice not of a mob rioter, but of a revolutionary. Not just the beating up of an elderly parson perhaps. It had to be nipped at the bud, and after the military declared the Riot Act, the magistrates did just that. While Robert languished in the gaol of Norwich Castle, his younger brother, Raphael Smith, passed away age 21. Tough times to live. Robert was released and fathered several more children. In 1841 he was living at Lydia's father's farm at Hill Common, with six of their children. But Robert was diversifying. He was recorded on that census as a hawker - a salesman. Three years later, in 1844, Robert's wife Lydia past away, age only 37 years. In 1849, with children to care for, Robert married a second time, to a widow named Frances Saunders (nee Husk). Her children by her previous marriage joined the household. In 1851, Robert, living still in Attleborough with his family, was now working as an umbrella maker! Then something happened. The railways had arrived, bringing opportunities for many poor Norfolk families to move away. The cotton mill towns were beckoning. Robert, in his fifties, and Frances, left my 2nd great grandfather Robert Smith in Attleborough, and moved up North to Sculcoates, East Riding, Yorkshire. In 1861, there they were, until 1870 when Robert finally passed away. The Man with the Mattock. Meanwhile his son Robert Smith (the junior) did quite well in Attleborough. He was a bricklayer. He had a trade. He married Ann Peach (who's own father had been transported to Tasmania in 1837 for stealing cattle), and they for many years ran a beerhouse and builders yard in Attleborough, called the Grapes. Their son Fred Smith also apprenticed into a trade. He became a wheelwright, moved to Norwich, where he met my great grandmother Emily Barber. They had several children in Norwich, including my grandmother Doris Brooker nee Smith. 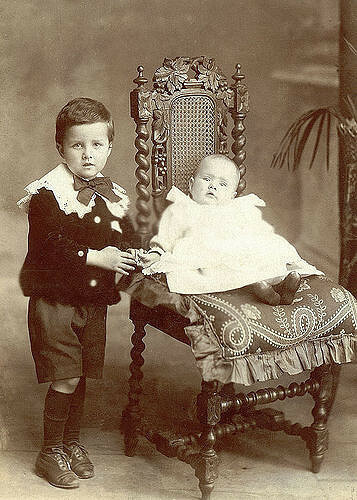 Fred Smith with his daughter Doris in Norwich circa 1908. As I wait for my Living DNA test results, I've been investing more research time into my documentary trail. This has included ordering several birth - marriage - death certificates from the GRO (General Register Office, UK Gov), and further checks, rechecks, and searches online using Ancestry.co.uk, Findmypast.co.uk, and FamilySearch.org. Filling in the blanks. looking for correlations. I've recently found an incorrect ancestor. A Nicholls on my mother's side. The usual case. I had found a perfect candidate in one very close parish. I followed their trail, added three generations including heaps of siblings. On recent review though - I find another candidate, in another close parish. Sure enough, when I investigate all of the evidence - this one was far more likely. It was backed by census claims. I even found my previous candidate living with another family years later in a census. I still make mistakes in genealogy, and expect to continue to do so. In this case, I've had to crop away at a bushy branch and replace it relatively, with a twig. It's all about pursuing the truth though, isn't it? To the best our abilities to use data that is available. The new GRO certificates haven't revealed anything revolutionary so far. All of them though have turned out to belong. The marriage of great grandparents Fred Smith to Emily Barber gave me their non-conformist chapel location in Norwich, their marriage date, and confirmed everything that I knew about them at this point of their life. The death of my 2xgreat grandfather Henry Brooker gave me his death date, cause of death, last job, last address in Dartford, and was registered by my great grandfather (living at the same address as during the 1939 register). without seeing the certificate, I could have never have proven that this was my Henry Brooker on the indexes. I also purchased the birth certificate of my 3xgreat uncle Henry Shawers. i was hoping that it might give some clues to my elusive 3xgreat grandfather Henry Shawers, and onto his origins. Nothing there I'm afraid, although again, it belonged to the right family. Confirms that he was who I thought. Now I'm waiting on the marriage certificate of George Barber to Maria Ellis. I have some concerns on this one, touch wood no unpleasant surprises. The above portrait is of my great uncle Leonard Smith, with my grandmother, Doris Smith of Norwich. Taken circa 1904. I've ordered a genetic profiling kit to test my mother. I want the results 1) for phasing with my own results, in order to better understand where different segments on my chromosomes originate from - from which parent. 2) because I feel that my mother has a particularly rich, documented, and very localised Norfolk ancestry. Finally 3) because I feel almost duty bound to do so, while I can. I've lost my father. My mother will not always be here, as neither will I. I wont always have the chance to do this. By examining Mum's SNPs, I'll be able to find out exactly what SNPs my late father gave me. I think that I've seen programs that try to rebuild the DNA of a missing parent, by combining the results of their children or / and other relatives. This has lead me to ponder over the future. Will we want to preserve the genetic scans of our parents and grandparents? Will the desire to capture photographic images of our elders, then to preserve them long after they've gone, transform itself into a desire to preserve genetic profiles? Will we value the raw data of their SNPs? Will great granny's genome be handed down in the form of binary data from chip to chip? Will families pride themselves on the ownership of a SNP scan data from a great great grandparent?